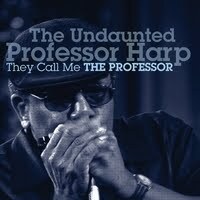 I just received the new release from Professor Harp, They Call Me The Professor, and I really like it. The title track, They Call Me The Professor has that unmistakable Texas lope and has really great harp tones throughout. The Professor has a great blues voice as well. Track two, Texago at Doyle's is a screamin harp instrumental that really cooks. Next up is Marty Robbin's Sugaree. The Professor takes the lead on vocals and there is a real solid guitar solo to keep the barrelhouse style blues crankin. Of course there is a harp solo... and I gotta say the guy can play. Fightin' The Battle is a cool soul tune which is a great number for this lineup with an interesting keys solo by Keith Munslow. It also shows that the Professor can carry the vocal duties with ease. What You Do To Me features Glen Hardy on boogie piano and the Professor delivering a great rendition of the Del Gordon track. There is also a sweet bari sax solo on this track by Doug James that I must comment is really in the groove. Wild Weekend has a 60's vibe but it a harp driven track with a cool guitar riff by Tom Ferraro and demonstrating the bands versatility. Sly Black Fox is a nice slow Texas blues with a great dragging lope and the Professor take the opportunity to blow it out. My Life: An Exercise In Blues is a slow blues with smokin' slide work by Steady Rollin Bob Margolin. The Professor continues to demonstrate his vocal and harp consistency keeping the sound of each song fresh. Both Bob and the Professor get the chance to demonstrate their own individual prowess on their instruments. It Just Comes Natural is a jazzy little tune along the lines of Gatemouth or Louis Jordan. The band demonstrates throughout that they are tight and ready for just about anything. The final track on this cd, Eine Fur Herr Schmidt is a nice slow number featuring the Professor on Chromatic harp. I gotta say that although this cd sounds like it was recorded 50 years or more ago because of it's authenticity, it sounds fresh and new. I highly recommend it for anyone who loves the beginnings of the electric blues. This recording is topps! Much obliged for that sterling revue. Fine recordings make it easy to make fine reviews! BTW--EINE FUR HERR SCHMIDT was (is) my tribute to my biggest influence, the late, great George "Harmonica" Smith.